A CD of highlights from the concert — also entitled Joni 75: A Birthday Celebration — will be available on March 1 from Decca. The album’s 16 tracks include such highlights as Brandi Carlile and Kris Kristofferson’s heartfelt take on “A Case of You,” Seal’s breathtaking “Both Sides Now,” Diana Krall’s haunting take on “Amelia,” and and Los Lobos and Friends’ rollicking “Dreamland,” which features Chaka Khan reprising her guest vocal spot, as she did on the original recording back in 1977. 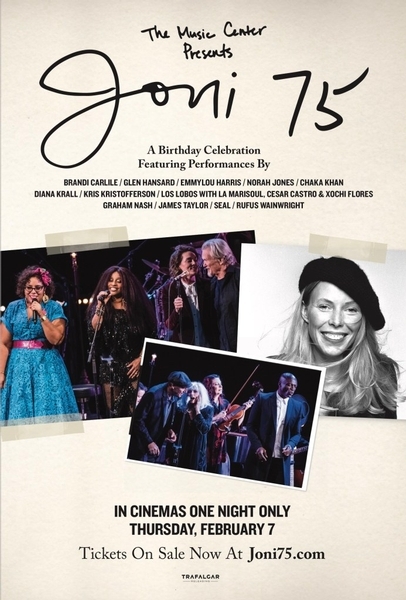 With a wealth of musical talent and selections from across Joni’s illustrious career, Joni 75: A Birthday Celebration is a fitting tribute to one of the legendary musicians of our time. The upcoming film screening and CD are perfect for fans who want to relive those two nights in November, or for those who weren’t able to see it in person. The film will screen across North America for one night only on February 7. You can find the screening nearest you and purchase tickets at Joni75.com. The soundtrack CD is set to arrive from Decca on March 1. Check out the pre-order links and take a look the album’s track list below! This article has been viewed 648 times since being added on January 25, 2019.